Sarah Palin has gotten an action figure. The 44-year-old Alaska governor has built up a devoted following since she was announced as John McCain's running mate, and a company called HeroBuilders has decided to cash in on it. The Connecticut-based doll design company not only offers Palin figures, but also Obama, Spitzer, and McCain action figures all priced at $27.95. 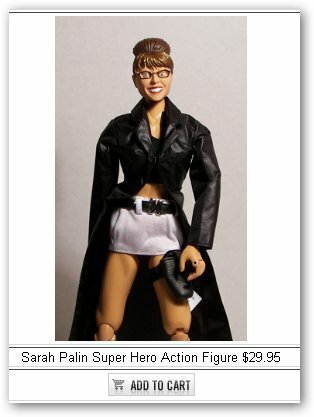 The Sarah Palin dolls come in three styles: a black business suit action figure, a scantily-clad schoolgirl design, and a "superhero" figure complete with trench coat and gun holster. Each doll stands 12 inches high.